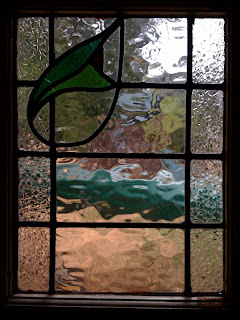 This is the stained glass window in the door of the "Vardo" (Gypsy wagon). It allows light in, but also provides privacy. I just woke a little while ago. We returned last night around 11:00 PM after having gone to an 8:10 PM showing of the latest Batman movie. The movie lasted for well over two hours. When I got home last night, I took some time to respond to some important emails. Today's Tumbleweed Tiny House workshop is a design workshop. Yesterday's workshop was dedicated to the building process. I'm really glad to be able to sit in on these workshops. I tend to be someone who avoids expending time and money to go to conferences or workshops. I figure if I need information I'll find it online or in a book, but these sessions seem very valuable. These workshops remind me of times when there is something I'm trying to diagnose and repair with a computer system and the solutions aren't on the web or in a book. So, I call technical support and navigate through a maze of interactive phone menu options, I soon realize that there's no pterecorded answers to my questions. I realiy just need to talk directly to another computer technician to bounce some ideas off them. So it is with building a home. It's not like there's a support number you can call and "press 3 to hear answers to many common problems," such as, "Have you tried restarting?" The participants who have attended the sessions came up with many good questions that were all related to their own unique building needs/desires. Some were interested in natural and alternative building materials that would have few if any chemicals. I'm going to take some time now for stretching (Yoga), breathing exercises, meditation, and then running. I hope to get online today so I can catch up on posting pictures from this past week. Since I've been on the road, it's been hard to find an Internet connection, and when I do find a good connection, there hasn't been time to sit for long. Hopefully today I'll get that time. It seems that when I write up these longer entries on the iPhone and post them by email the formatting (word wrap) gets messed up for some reason. So, I need to get on the web to fix that manually.